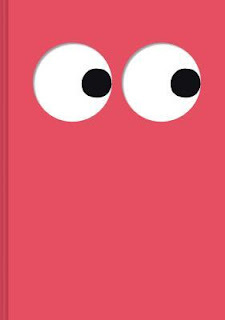 GoodReads Summary: This book has eyes—and an irresistible cover! Kids will delight in this innovative seek-and-find picture book that may be read from front to back and from back to front! Two adorable characters embark on an over-the-top game of hide-and-seek through eleven richly detailed scenes, including a lively neighborhood, a bustling shop, an offbeat office space, a festive concert, and more. Open the book from the front to search for one of the characters. Then, open the book from the back to search for the other. It's two hide-and-seek experiences in one book. As the characters move through each illustrated spread, their colors change, too, adding to the abundant fun. What I Think: Ohmigosh, I adore this book! It's super unique in so many ways. It's a big book, bigger than most picture books and the cover has holes cut in it for the eyes because there are holes in the pages too. It's so fun! What I really love is that it's such a simple cover but so busy on the inside. I absolutely fell in love with the illustrations right away and we had fun searching for our little friend as we moved through the pages. I'm sure other kids are going to have a ton of fun. I'm not really sure how this books works as a mentor text except for that it's super fun and any young artists out there might get some inspiration from the artwork or the seek-and-find fun!